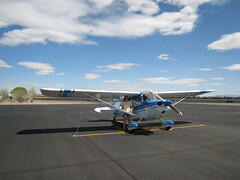 On Sunday I flew out to Silver Springs airport where my sister picked me up for Easter dinner back at their place in Fernley, Nevada. The airport web site is clearly a marketing device. Especially the facility page which touts the airport as being "a 24 hour, fully operational airport capable of accepting 737s" and such. Here are a few observations from my first visit to Silver Springs. There aren't many turnoffs. As you can see, there's one at each end of the runway and another in the first bit of runway 23. But if you land past that, it's a long taxi down to the end, so you'll need to do a 180 to taxi back. The runway is 6,000 feet long. Though there is no AWOS on field, after you key the microphone and make an inbound call an automated system will provide basic AWOS or ATIS style information (winds, active runway, etc.). If it doesn't, try three clicks on the microphone. Despite the impressive things said on the web site (noted above) and the massive runway, there's no fuel available on-site. So if you're flying that 737 in, make sure you've got lots of Jet A or, in my case, 100LL. The new taxiway and tie-down areas are in great shape. It's very smooth, clean, and well marked. But there are no tie-down chains so bring your own ropes. I was glad to have a set with me. There's a prominent gate at the airport entrance off of the highway. But I'm not sure why, since it's a 24-hour facility. Have you been to Silver Springs? What did I miss? The gate is obviously in case there's a terrorist threat against the airport, so it could then be closed. The Department of Homeland Security no doubt spent a couple million bucks ensuring that Silver Springs airport will be safe from the bad guys! now why would a 737 ever need to land there? Here's part of the scoop. In addition to the Hub aren't they supposed to be building a highway that comes straight across from Reno? The Hub would be a Great Idea since Silver Springs is right in the middle between Reno, Carson City, Yerington, Fernley and Fallon and it would create a lot of jobs in the area. That extra long runway makes it and excellent alternate landing field for military aircraft from Fallon NAS in case of an emergency.